In a reciprocating air compressor, the valves are one of the most significant parts in the regulation and flow of pressurized air. When a valve is in optimal condition and performs according to plan, compressed air is distributed evenly and effectively for numerous processes. If a valve becomes faulty, however, the system lags and processes are ill-affected. If you operate a reciprocating air compressor, it is critical to ensure that the working environment is conducive to the machine. If a compressed-air workspace is plagued with elements and activities that could be harmful to a compressor valve, you are liable to have performance issues well short of the system’s natural life expectancy. 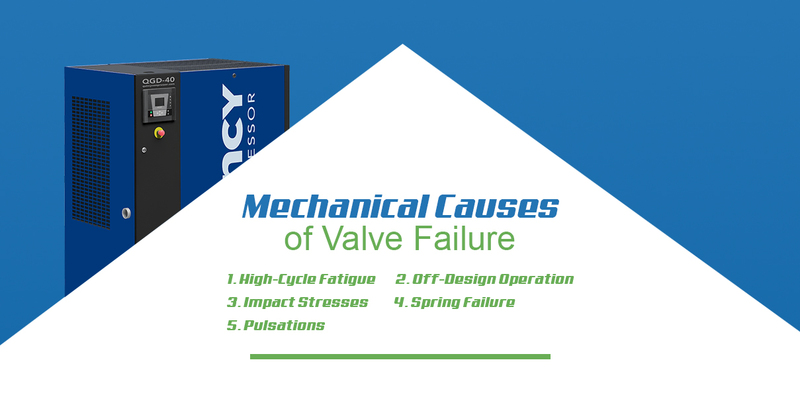 Overall, valve failure is due to one of two types of causes — environmental or mechanical. If the valves come into contact with corrosive elements, the metal will gradually wear away, and the valve will lose its ability to perform its proper function. Corrosion eats away at the surfaces of metal components and can ultimately spread to adjoining surfaces. Once corrosion takes hold in select areas, it can eat holes directly through a metal surface. Like any component within a compressed-air system, a valve can be infected with foreign elements that can dirty the inner lining and obstruct the flow of air. If an air compressor is in a dusty or heavily dirt-prone working environment, impurities could pose a threat to the cleanliness and functionality of a reciprocating compressor valve. In valves that are subject to liquid flow, irregularities in the flow of liquids can have a damaging effect on the inner lining of a valve, especially over the course of years of exposure. When a mix of flowing and bubbly fluids pass through a valve — a typical occurrence in any valve where water and oil both pass through — liquid slugs can take their toll on valve metal over time. If a reciprocating compressor valve comes into contact with stale or acidic lubricant, the effects can be damaging to the metal. Though essential, lubrication can also be detrimental if allowed to linger past its expiration. If a lubricant becomes mixed with corrosive elements, it can take on acidic properties. If it hardens, it serves no useful function within an air compressor. Lubrication can also be detrimental if excessively applied to a given component. If a reciprocating air compressor runs at high cycles over lengthy periods of time, the stress is liable to take its toll on various system components, including the valves. If you consistently run an air compressor at higher-than-average settings, you should keep an eye on the valves. If you run your air compressor nonstop for hours on end at high cycles, you should also inspect the valves more frequently. When it comes to reciprocating air compressors, each model is designed for its own range of operations. If you use a compressor beyond its intended means, you are liable to run into performance issues after weeks or months of such overuse and abuse. If your air compressor has been used in ways that go against the recommendations of the manufacturer, performance issues that do emerge could be the result of valve failure. If an air compressor endures undue stress, the effects are liable to reverberate throughout the system and its various components, including the valves. Whether the impacts are physical or mechanical, a valve could easily wear down through repeated impact stress. If an air compressor is accidentally dropped or shoved around within its working space, these sudden movements may ultimately lead to weakened valves. If the valve is attached to a spring, the assembly could fail to function properly if the spring wears down from accumulated stress. Springs are designed with specific levels of flexibility. If a spring becomes too soft or too firm for its intended function, it loses its ability to serve its corresponding components. If the valve relies on the functions of a spring, failure of the latter will have a detrimental effect on the former. If air travels through a compressed-air system at irregular intervals, the impact could be harmful to the valves. A reciprocating air compressor is designed to pressurize air at predictable frequencies, and each part within the system is fitted for a certain level of performance consistency. If the system suddenly functions in abrupt or violent fits and starts, the valves are liable to incur unfavorable impacts. 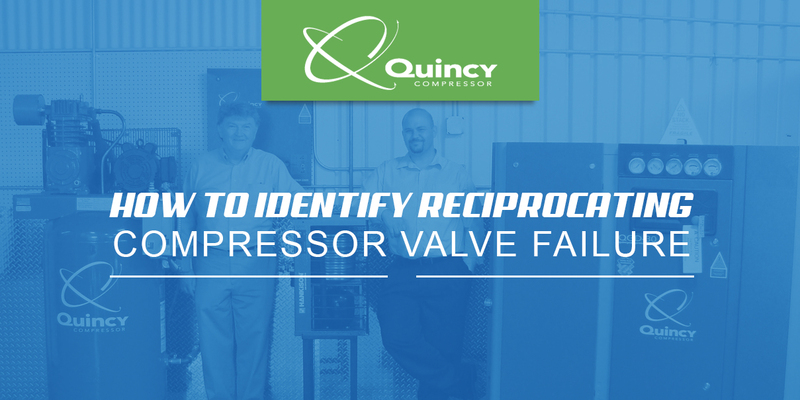 Problems with a reciprocating compressor valve can manifest in a multitude of ways. As such, the symptoms are numerous. Signs of valve failure can be identified on the compressor itself as well as through the results of various processes. Irregularities are generally a sign of poor system health, including instances of valve failure, which sometimes results in uncharacteristically high suction pressure. A tell-tale sign is when surges in suction pressure are combined with lower-than-normal discharge pressure because here you have two inter-related, valve-reliant functions failing to perform at system standards. If the discharge from your reciprocating air compressor is weak and inefficient, the valves are a probable culprit. A compressor is designed to discharge pressurized air at specific consistencies as dictated by the system settings. When this fails to occur or when the pressure appears inadequate, the issue is likely due to obstructive valve passage. The situation is most apparent when the weak discharge pressure is coupled with excessive suction pressure because here you have correlating processes mutually failing at their respective functions. As much as it can be a relief to have an air compressor function at low volumes, it can also be a cause for concern if the compressor seems too quiet to be functioning at full capacity. If your air compressor sounds as though it is fading out or humming along quietly, chances are the valves are failing the system. If a reciprocating air compressor fails to draw power at normal levels, the issue may be down to a system obstruction rooted in a valve. A compressed-air system will consume a certain amount of energy to move air along from the pressurization stage to the end use. If the amp draw is uncharacteristically low, the system might be incapable of drawing normal amp due to a lack of valve flow. If a discharge valve fails to seal securely, an unusually low head pressure will result from the problem. During each upstroke, air will be discharged from the cylinder. Within seconds, the air becomes pressurized, and some of it slips back into the cylinder due to the unsecured valve seal. This short cycle through which the air is subjected results in unusually high discharge temperatures. When a discharge valve is forced to cope with exceedingly high temperatures, carbonization is liable to take root in the oil along the lining, plate and backings of the valve. As the overheating spreads, the iron material that comprises the valve is liable to accelerate the chemical reaction. The valve is also likely to leak as a result of these effects. Another effect of excessive valve heat is the development of contamination, which can form along the valve plate as a chemical reaction to the high temperatures. Contamination comes from a mix of broken-down oil and dust in the pressurized air, which combine to form a sludge along the valve plate. If the electric bills have increased at your work facility despite no change in the use of your machines, the compressed-air system might be over-consuming energy just to fulfill normal functions. 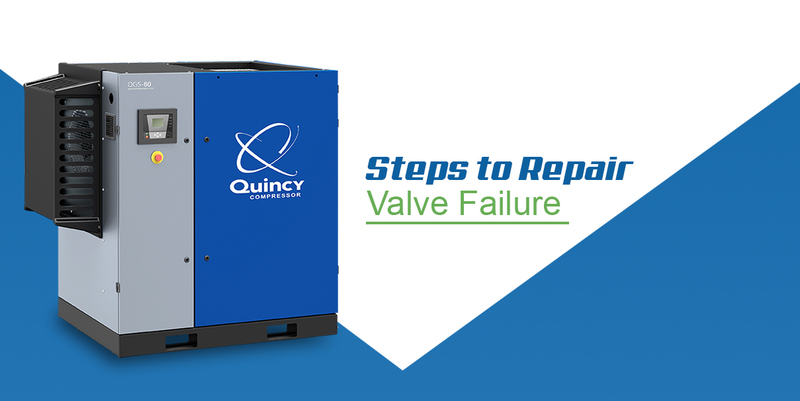 When an air compressor suddenly needs more energy to perform the same old functions, the issue is usually down to a system problem, such as a failing valve. If a reciprocating air compressor is unable to cool itself properly, the uncharacteristic heat could easily stem from an obstructed air passage within the system. As the pressure mounts, the compressor could overheat due to its inability to pass air as programmed. Such problems are often rooted in faulty valves. If too much pressure mounts within an air compressor, air is not flowing fluidly from one compartment to another. The process is intended to move at an even pace from the time that air first enters the system to its ultimate end use. If the pressure mounts and the system becomes overloaded, there is likely an issue of obstructed flow that could easily be rooted in a valve. In a system that relies on the processes of a reciprocating air compressor, opposite pressures should not be in proximity to one another. When high-side and low-side pressure become too close for comfort, it is generally a sign of lost pumping capacity. In a system where a valve has failed, the high-side pressure will often be uncharacteristically low, and the low side will be uncharacteristically high. 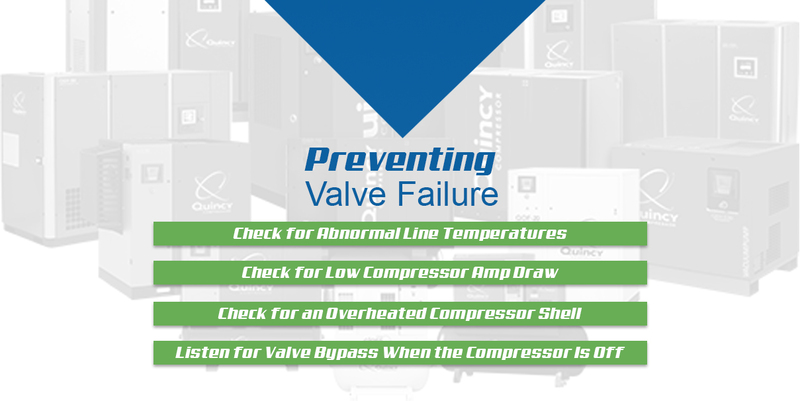 To prevent the failure of a reciprocating compressor valve, conduct proper maintenance. Monitor the valve and corresponding system components on a periodic basis. The charts and stats can give you concrete information as to whether the system is behaving as it should. Also check the temperature of the system and listen for unusual sounds as these can serve as key indicators to the root of the problem. If you suspect that your air compressor has a valve-related defect, examine the line temperatures on your latest chart. Has the temperature followed an expected arc according to the month in question? Or has there been an unexpected spike or dip along the chart since the time that you first suspected a problem with the system? Is your air compressor drawing normal current levels while in operation or have there been infrequencies due to an inability on the system’s part? If you have noticed performance issues that you suspect are rooted in a valve, a low compressor amp draw could be a confirming factor. A healthy, free-flowing system should consume power at normal levels. Is the compressor shell hotter than normal? Overheating issues are often the result of bottled pressure within the compressor. If the system is unable to process air at a precise pace according to the program, heat could easily mount within the compression chamber and cause the shell to overheat. A failed valve could be at the root of such an issue. One of the more odd yet tell-tale signs of valve failure is when a valve sounds as though it is active despite the system being inactive. If a valve makes whistling or whooshing noises after the air compressor has been shut off, the valve is still finishing processes that should have finished when the system was active. A valve that stalls is a failed valve. 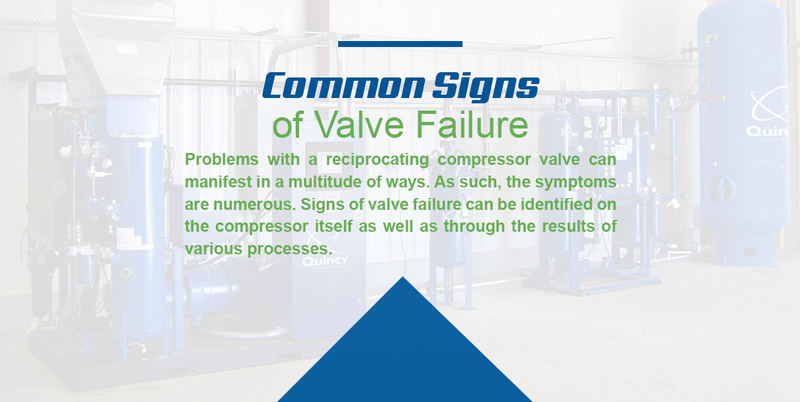 Valve issues can stem from numerous compressor problems, but each of these issues has specific symptoms. When you know the problems associated with each valve-related symptom you can more easily take steps to rectify the situation. When performed early before a problem spirals out of hand, compressor valve troubleshooting can save you time and grief. If the valves and piston rings make knocking noises, the issue could be due to improper lubrication, insufficient head clearance or excessive cross-head clearance. To remedy the problem, inspect the lubrication and adjust the heads. The lubrication could be old and acidic or applied in excessive or insufficient quantities. In any case, wipe away the old grease and apply a new coat of a recommended grade in the proper quantity. If you notice vibrating motions from your air compressor, the issue is possibly due to poor pipe support, a loose pulley or a faulty unloading function. For possible solutions to the vibration issue, inspect the pipe support, pulley and unloading valve for signs of looseness or inadequacy. 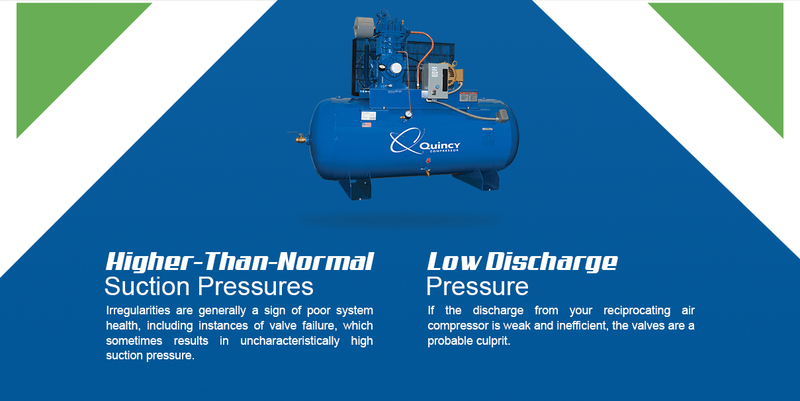 If the discharge pressure from your reciprocating air compressor is exceedingly high, the problem is possibly due to an instrument error or a faulty unloading valve. Alternately, the discharge level could be due to exceeding high demand on the system. Inspect the unloading system for a possible answer. 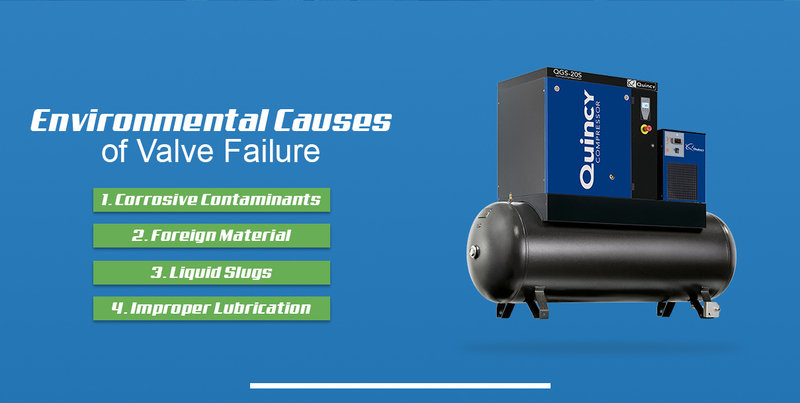 If the discharge pressure of your air compressor is uncharacteristically low, the problem is possibly due to an instrument error, a faulty unloading valve or a leakage in the system. To get to the heart of the matter, inspect the system for leakage, valve wear and instrument problems. 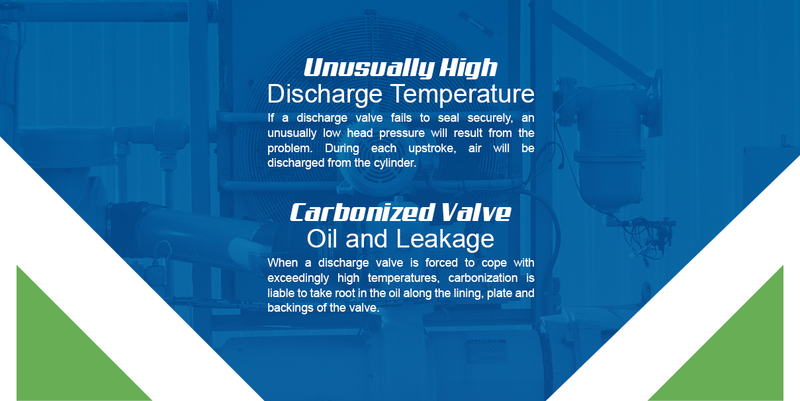 If the discharge temperature is too high, the problem is possibly the result of an instrument error, a worn LP valve or a faulty unloading valve. 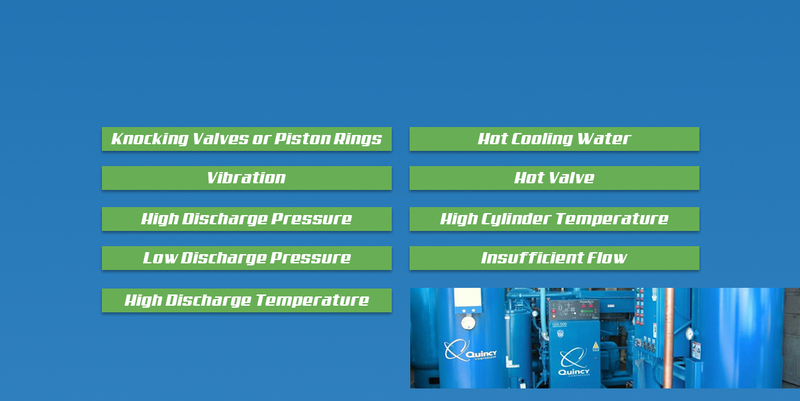 A high temperature could also result from high discharge pressure. Inspect the LP valve and unloading system for a possible answer. If the system cooling-water has a high temperature, the problem could stem from a low frequency of water flow, a worn LP valve, a fouled system component or an error with an instrument. For a possible answer to this issue, inspect the components in and around where the water is stored. If the valve temperature is uncharacteristically high, the issue might stem from valve wear, high discharge pressure or an instrument error. Inspect the discharge pressure and examine the condition of the LP valve. Consider also that the valve could have run unloaded for too long. If the cylinder of your air compressor is too hot, the problem could be due to any of the usual causes, such as a worn LP valve, excessive discharge pressure or faultiness with an instrument. There is also the possibility that the system has run at the wrong speed. Check the speed, valve condition and discharge pressure for possible answers. If the flow rate of your compressor system is appallingly low, the issue could be down to a dirty suction filter or the usual suspects, such as a worn LP valve, a defective unloading system or an error with an instrument. Inspect the suction filter and examine the condition of the valve for a possible answer. To keep your compressed-air system working over the long haul, you must perform proper maintenance. However, the health of your air compressor will also depend on the manufacturer. For the best return on your investment, it is always wise to stick with a name that you can trust in the world of air compressors. For nearly a century, Quincy Compressor has been the world’s leading manufacturer of air compressors and related parts. Throughout the industrial sector, our reciprocating air compressors have been the driving force behind countless high-volume productions. We also fix air compressors and install replacement valves and parts on older models. 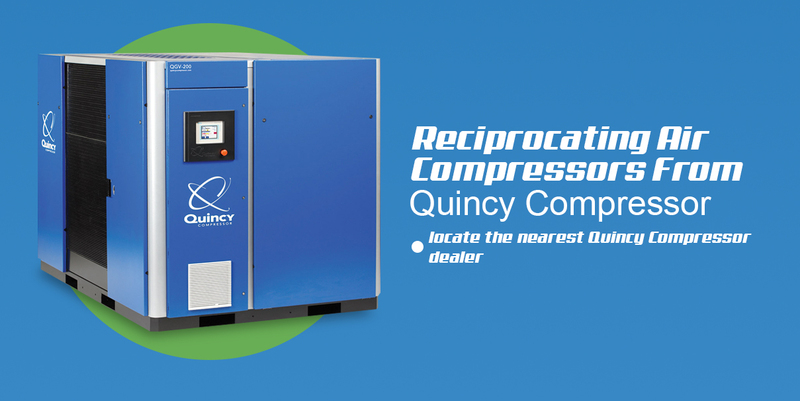 For more information about our reciprocating compressors and parts, or to schedule service or maintenance with Quincy Compressor, locate the nearest Quincy Compressor dealer.